March 30, 1999, will go down in cricket history as one of the greatest days for the West Indies. On that day, at the historic Kensington Oval in Barbados, a hero performed one of the game’s most amazing feats. Brian Lara scored his epic 153 not out – rated by many observers as the best fourth innings knock in the game’s history. With the Windies needing a near impossible 310 for victory on a deteriorating fifth day pitch, Lara went where no man had gone before. His score was just under half the team’s total, the Windies reached the improbable target with nine wickets down – Lara did what Lara did best – and the home fans left rejoicing with a victory by the narrow margin of one wicket. 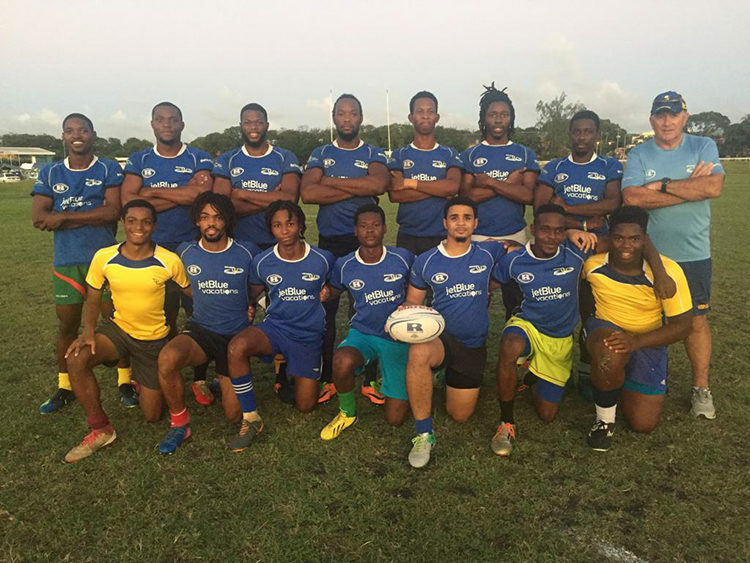 Lara’s team found their mojo and their voice, and the entire region was caught up in rapturous merriment and celebration. The Aussies were stunned into silence. It was 20 years ago, but Jimmy Adams, remembered the day like it was yesterday. “This date marks the 20th anniversary of the third Test of the 1999 home series against Australia which was played in Barbados,” said Adams. Walsh took 5-39 off 17.1 overs in the second innings, as the Aussies folded for 146. 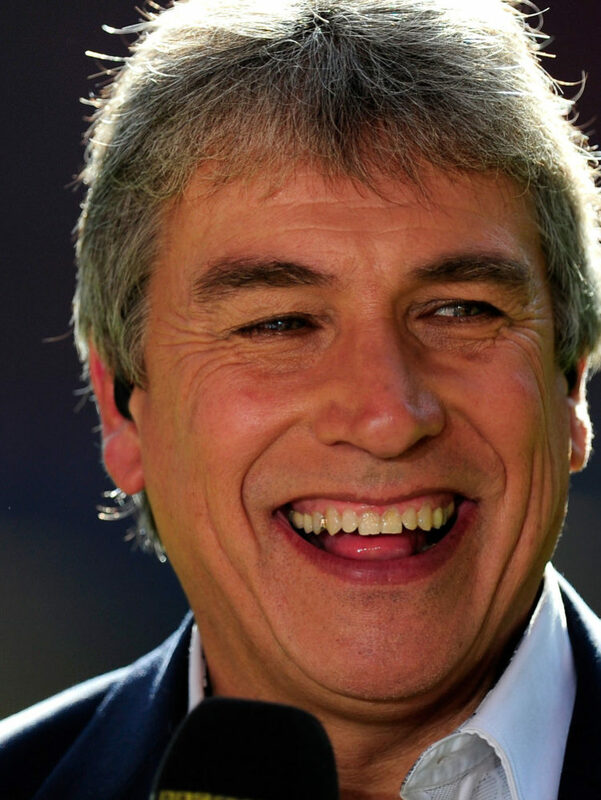 He would return with the bat in the second innings to help Lara complete the record win. Earlier, Sherwin Campbell made 105 – his second Test ton on home soil – as the home side scored 329 in reply to 490. 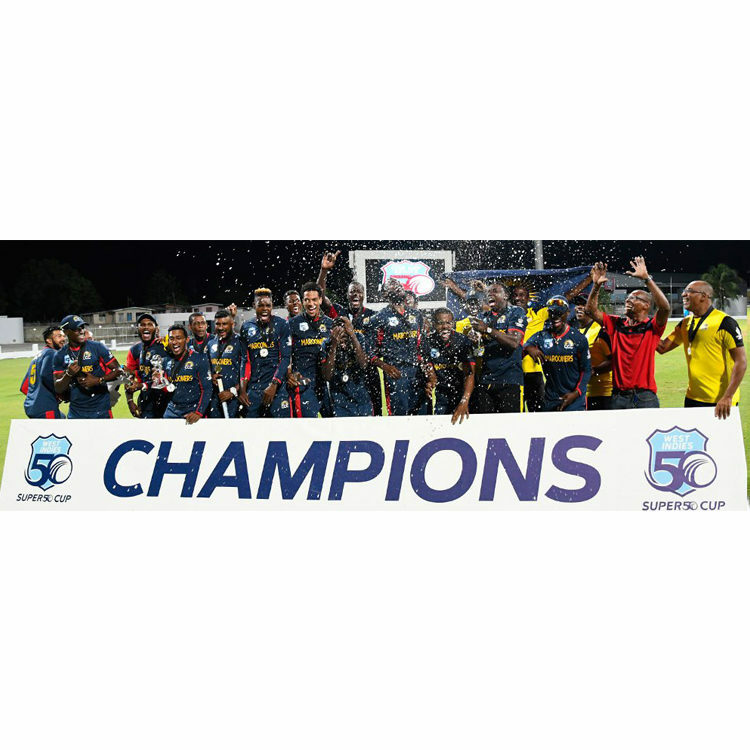 BASSETERRE, St. Kitts – An International Home Tour in which they scaled memorable heights ended sadly for WINDIES, after another perplexing batting collapse saw the reigning World Twenty20 champions dismissed cheaply and England clinch an eight-wicket victory on Sunday here, to sweep the Sandals Twenty20 International Series. The WINDIES batting was undermined by a destructive spell from left-arm fast-medium bowler David Willey, whose 4-7 from three overs – the second-best ever for an England bowler in T20Is – earned him the Player-of-the-Match award and set the visitors up in the final match at a smoke-filled Warner Park, caused by a nearby bushfire. 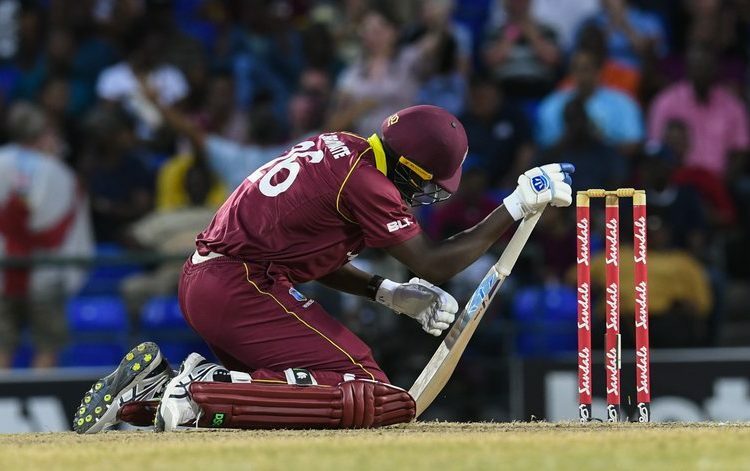 Choosing to bat, the WINDIES were bowled out for 71 – their third lowest total in a T20I ever – in exactly 13 overs – the fifth shortest completed T20I innings ever – two days after they fell for their lowest ever T20I total of 45. No batsman reached 20. The WINDIES bowlers then failed to conjure up any magic, as England raced to victory with little trouble, although they lost the scalps of openers Alex Hales and Jonny Bairstow before their captain Eoin Morgan firmly swept a flighted delivery from leg-spinner Devendra Bishoo through backward square leg for four to formalise the result with 57 balls remaining. The result meant that the WINDIES were swept 0-3 in the series, after they lost the first match by four wickets last Tuesday at the Daren Sammy Cricket Ground in St. Lucia and the second match by 137 runs two days ago at this venue. Today, Shai Hope was caught at cover off Willey for a duck, driving loosely at a slower delivery (nought for one, 0.1 overs). Shimron Hetmyer was caught at mid-off for eight off Willey, miscuing a lofted drive (10 for two, 2.4 overs). John Campbell was caught at cover for 11 off Willey, skying a lofted drive at a slower delivery (24 for three, 4.1 overs). Darren Bravo was caught behind for four off Willey, edging a delivery that squared him up, then lifted and left him (24 for four, 4.3 overs). WINDIES captain Jason Holder was caught inside the long-off boundary off part-time leg-spinner Joe Denly for 11, miscuing an ill-advised, lofted drive (45 for five, 8.5 overs). Nicholas Pooran was caught at deep mid-wicket off Mark Wood for 11, pulling a short ball to deep mid-wicket (48 for six, 9.4 overs). Fabian Allen was bowled by leg-spinner Adil Rashid for seven, playing back and across to a googly from leg-spinner Adil Rashid (54 for seven, 10.3 overs). Carlos Brathwaite was brilliantly caught behind off Wood for a duck, trying to steer a delivery to third man and wicketkeeper Jonny Bairstow, seemingly beaten for pace and lift, just stuck out a mitt and the ball stuck (56 for eight, 11.2 overs). Sheldon Cottrell was bowled by Wood for four, making room and essaying a flashy drive (60 for nine, 11.5 overs). And, Obed McCoy was bowled by Rashid for 10, playing back and across to a googly to bring the innings to a close, leaving Devendra Bishoo not out on three. Bowling: Willey 3-0-7-4; Curran 1-0-8-0; Jordan 2-0-14-0 (w1); Denly 2-0-14-1; Wood 3-0-9-3; Rashid 2-0-18-2. When WINDIES bowled, Holder had Alex Hales caught at deep back square leg for 20 from a miscued hook (21 for one, 4.3 overs). And, leg-spinner Devendra Bishoo bowled Bairstow for 37, playing back and across to a delivery that spun sharply (60 for two, 8.1 overs). Bowling: Cottrell 1-0-16-0; Allen 4-1-25-0; Holder 3-0-19-1 (w1); Bishoo 1.3-1-11-1; Campbell 1-0-1-0. Barbados-born, England pace bowler Chris Jordan was named Player-of-the-Series. So the big one is coming. One of the great international cricket rivalries resumes when England arrive in the West Indies on 11th of January 2019, to start the biggest International Home Series between the two teams since 2009. 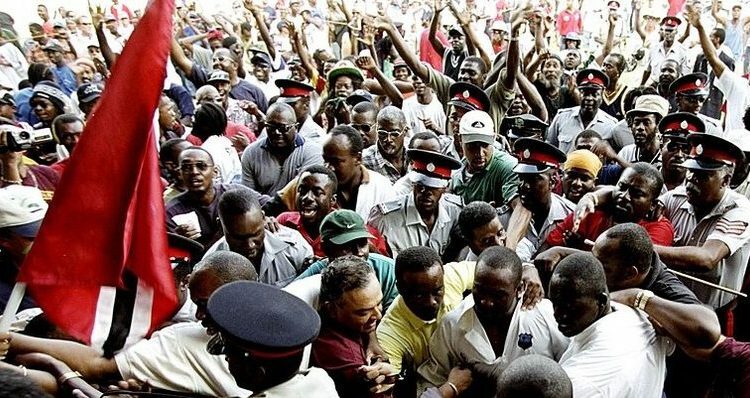 ST JOHN’S, Antigua – The big one is coming, and WI are ready. Tickets are now on sale and available to buy online as of today (November 1) for the 2019 West Indies vs England series, the biggest England tour to the Caribbean in the last 10 years. All but 12 of Corbin’s 72 from 53 balls were in boundaries and he shared a Marooners record opening stand of 109 with left-hander Kjorn Ottley to help them successfully chase a target of 205 for a victory that gave them their first regional title at the third time of asking. Marooners captain Carlos Brathwaite, the WINDIES Twenty20 captain, snared 3-42 in his allotted 10 overs and Akeem Jordan captured 2-30 from 7.1 overs. 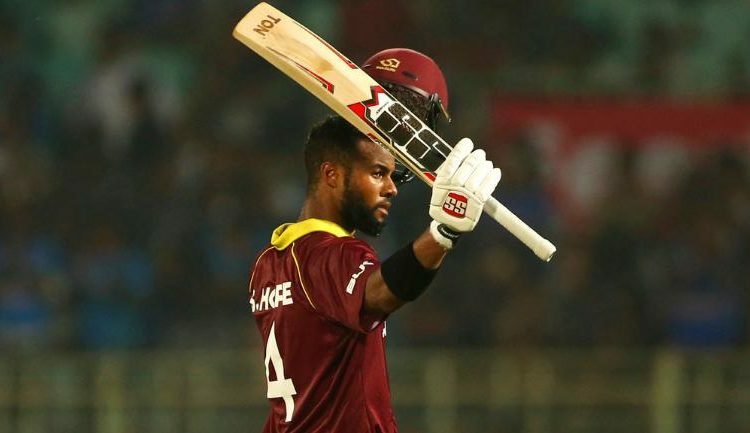 PUNE, India – Shai Hope with another calculated batting innings and Ashley Nurse with an explosive 40 off 22 balls helped the WINDIES to secure a 43-run victory over India in the 3rd One Day International in Pune and level the 5-match series 1-1. India won the toss for the third consecutive time in the ODI series, this time they sent the WINDIES in to bat first. This, after getting a scare in the second match when the WINDIES chased down the target but unfortunately came up 1-run short, resulting in a tie. Kieran Powell and Chandrapaul Hemraj once again started strong for the WINDIES. Hemraj went after Bhuvneshwar Kumar and Jasprit Bumrah with the new ball. He carted them for 2-fours and 1-six for his 15 runs, while Powell had the exact 2-fours and 1-six for his 21, but Bumrah had the last laugh, as he accounted for both openers. WINDIES 38/2 in 8.1 overs. The scoring was slow to come by as the newly added Indian pace attack tried to wade deeper into the WINDIES batting order. 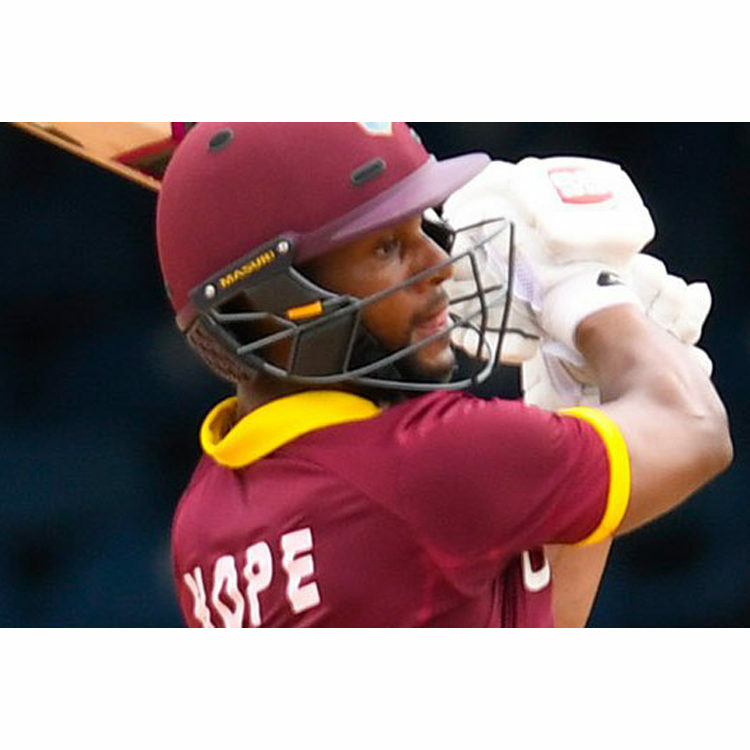 Centurion from the previous match Shai Hope started his calculated innings, tucking around the ball for quick singles and twos in the spread field-setting. Marlon Samuels made 9 which included 1 boundary, but despite single-digits in his batting card, his bowling would prove more useful later on in the match. Once again Hope combined with Hetmyer and the world got another glimpse into the bright future of WINDIES cricket. The pair batted with comfort and synchronization, continuing their brilliant partnership from the 3rd ODI. Hetmyer flashed his bat to the bowlers without fear, playing the difficult Kuldeep Yadav and Yuzvendra Chahal to all parts of the Maharashtra Cricket Association Stadium, on his way to 2-fours and 3-sixes. But Kuldeep who has provided some trouble to Hetmyer during the tour, scalped his wicket once again, when Dhoni with his quick hands, took off the bails to stump Hetmyer for 37. The partnership was worth 56 runs. WINDIES 111/4. Rovman Powell only lasted 4 runs before Kuldeep accounted for his wicket as well. Then came captain Jason Holder, like Hetmyer, he and Hope batted in tandem to rebuild the WINDIES innings. The Skipper and Hope added 76 runs together to carry the WINDIES total to something defendable, before Holder skied one high up and was caught for 32 off Kumar. Hope hung his head in despair just as the pair was inching closer to a 300 total. Kohli reintroduced Bumrah and he produced a beauty of a Yorker to light up Hope’s stumps shortly after. 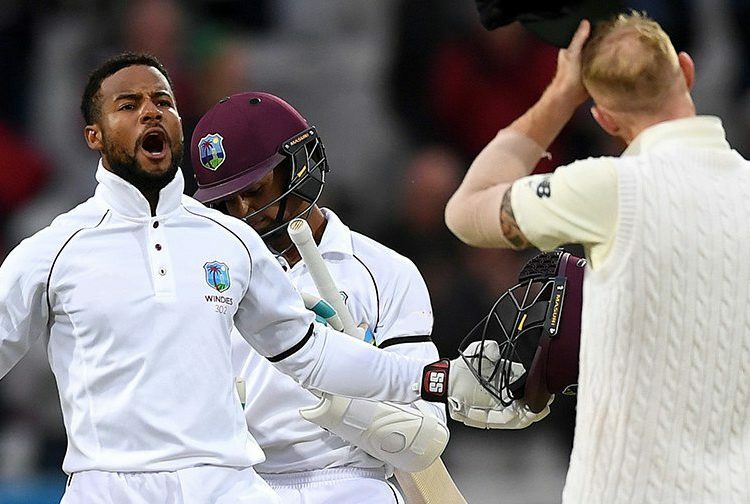 Shai Hope fell an agonizing 5-runs short of a second consecutive century. His innings included 6-fours and 3-sixes. Just when it looked like the WINDIES would fold quickly, Ashley Nurse stepped to the crease and showed why he’s known as a big-hitting tailender. He smashed 4-fours and 2-sixes on his way to a blistering 40 off 22 balls before Bumrah trapped him LBW. Kemar Roach got in on the action as well, hitting 1-four and 1-six to finish on 15 not out and Obed McCoy on 0 not out. The WINDIES 283/9 from 50 overs. Jasprit Bumrah had the best figures for India, taking 4/35 from his 10 overs. Rohit Sharma’s batting woes continued for a second match, where he managed 2-fours before Holder bowled him for 8. Shikhar Dhawan and Virat Kohli set about to show why they’re ranked in the top-three batting order in the world. The pair added 79 runs before Dhawan who struck 5-fours on his way to 35 was LBW to Nurse. Once again Kohli carried on his batting masterclass as he raced to another century. He was ably supported by Ambati Rayudu. After a 47-run partnership, Rayudu was bowled by Obed McCoy for 22. Rishabh Pant made a quick 24 runs in a 37-run contribution with Kohli before Nurse had him caught behind off a faint edge. India 172/4 after 31.1 overs. Kohli remained in the middle determined to take his team to victory while wickets fell around him. Dhoni never troubled the scorers as Holder had him caught behind for 7 and Bhuvneshwar Kumar added 10 runs before McCoy had him caught for 10. The game changer came in 42nd over when Holder introduced Marlon Samuels into the bowling attack. He got the wicket the WINDIES were desperately seeking, when he bowled Kohli for 107. The match was all but now victory for the WINDIES. Kemar Roach had Chahal caught for 3, while Samuels returned to clean up the Indian innings, taking the wickets of Khaleel Ahmed and Bumrah for 3 and 0 respectively. India all out for 240 in 47.4 overs, handing the WINDIES victory by 43 runs and leveling the series 1-1. Samuels finished with the best bowling figures for the WINDIES with 3/12, McCoy had 2/38, Nurse 2/43 and Holder 2/46. Shai Hope for his 95 runs was the Bankable Player of the Match, while Ashley Nurse for his 40 off 22 and 2/43 was the Player of the Match. The fourth ODI takes place on October 29 at the Brabourne Stadium in Mumbai. 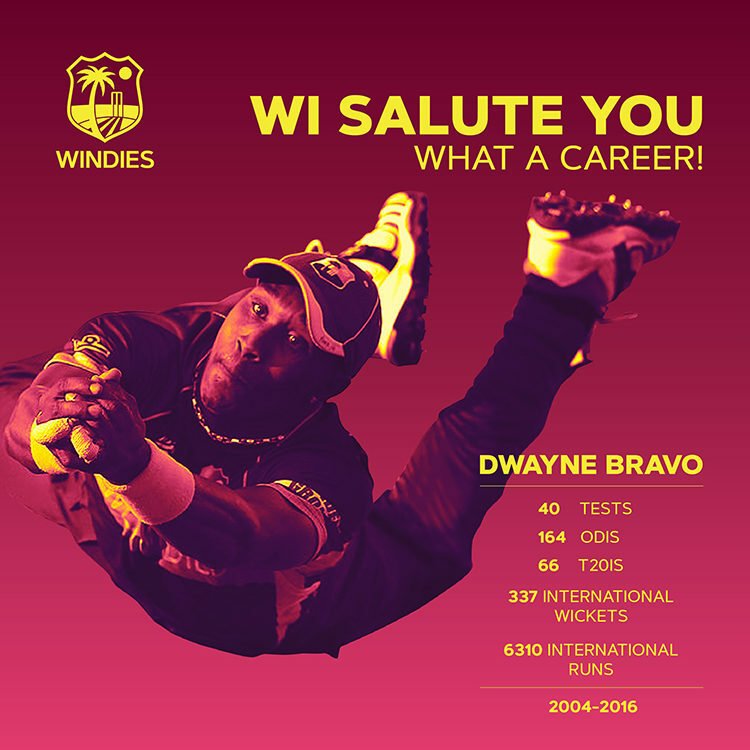 St John’s, ANTIGUA – Cricket West Indies salutes Dwayne Bravo for his 12 years’ service to West Indies Cricket. This following the all-rounder’s announcement of his retirement from international cricket, yesterday (October 24).